Researchers from MIT think they’ve uncovered a natural warning system for climate change: the oceans’ color. 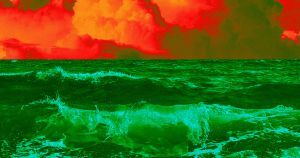 According to the researchers, we can track the effects of climate change by paying attention to the color of ocean water from space — and based on their calculations, we should expect our planet to look quite different relatively soon. When sunlight hits water, the water molecules absorb certain colors of the light spectrum more strongly than others. The blue part of the spectrum is absorbed least strongly, meaning the blue light reflects back out, making the water appear blue. The appearance of water can change depending on what’s in it, though. Areas with higher concentrations of phytoplankton, microscopic marine organisms, appear more greenish because the organisms absorb more of the blue spectrum light and reflect some of the green. In a study published on Monday in the journal Nature Communications, the MIT team describes how it created a model of the Earth that simulates future changes in phytoplankton ecosystems as water temperatures rise due to climate change, and predicts the effect those changes will have on the oceans’ color. When the team compared their model to past sunlight reflection measurements produced by satellites, they found it was accurate enough to predict future changes to the oceans’ color. By using satellites to keep an eye out for early signs of color changes in the oceans, the MIT team believes we may be able to better prepare for the domino effect that changes in phytoplankton can have on the rest of a marine ecosystem. “The nice thing about this model is, we can use it as a laboratory, a place where we can experiment, to see how our planet is going to change,” she added.